Denver voters decided on a number of ballot measures yesterday. One of them, which partially funds a $1.1 billion National Western Center project by extending a hotel and rental car tax, will affect how people get around in northeast Denver. The National Western Complex has been the setting for the country’s premiere stock show for more than 100 years, but the things that made the event so successful — huge swathes of agricultural land and industrial meatpacking facilities — have also made the area anachronistic as Denver becomes more than a cow town. Voters just OK’d financing for Mayor Michael Hancock’s administration to transform the dilapidated complex into a symbol of “the new West” by redeveloping the site into a year-round campus. It will include a new exposition hall, equestrian center, an arena to replace the Denver Coliseum, and an education center for agricultural sciences run by Colorado State University. The National Western Center Master Plan includes three new streets with a lot of nice pedestrian, bike, and transit infrastructure. Protected bike lanes, huge sidewalks, and a circulator bus would lead to the new destinations and create connections between the neighborhoods of Elyria Swansea, Globeville, and RiNo, which the site currently cordons from one another. Problem is, the car traffic generated from the massive amount of parking spaces planned would swamp all the benefits of those active transportation improvements. The plan claims that 85,000 daily visitors will require up to 18,850 parking spaces during the annual stock show. That’s two weeks out of the year. 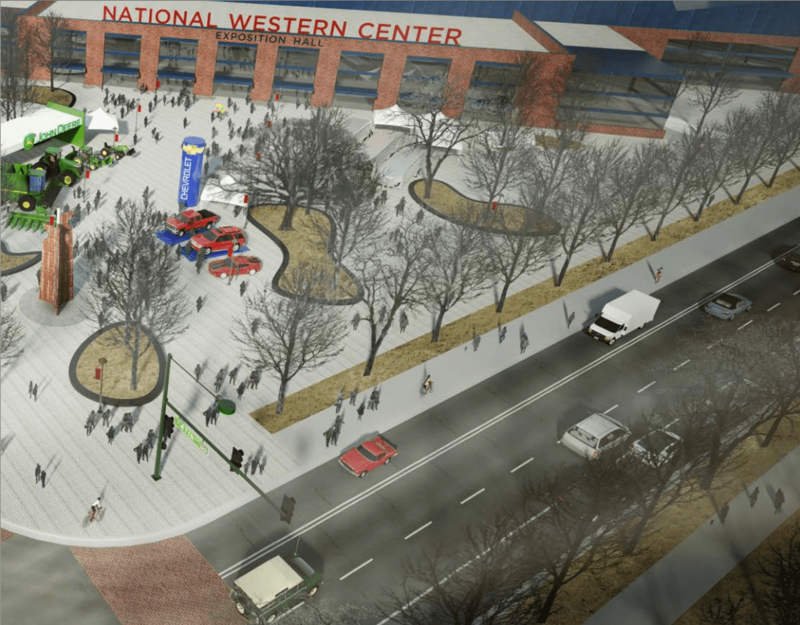 For the rest of the year planners say the National Western Center might “need” closer to 11,000 parking spaces. All those parking spaces will cost a bundle. The average cost to construct a structured parking spot in Denver is about $17,000. That means Hancock asked voters to OK roughly $300 million for parking spaces alone. That’s a good chunk of the $673 million Denver would put towards the project. It’s also important to keep in mind that projections of parking demand are to a large extent arbitrary and frequently off the mark. The amount of use that parking spaces get is contingent on several factors, including how many parking spaces are provided, how they are priced, total travel demand, and what other travel options are available. According to Denver’s planners, for instance, for every 5 percent of total trips to the National Western Center that people take via transit, 1,000 fewer parking spaces need to be constructed. So are massive parking garages the best way to go about spending public funds? 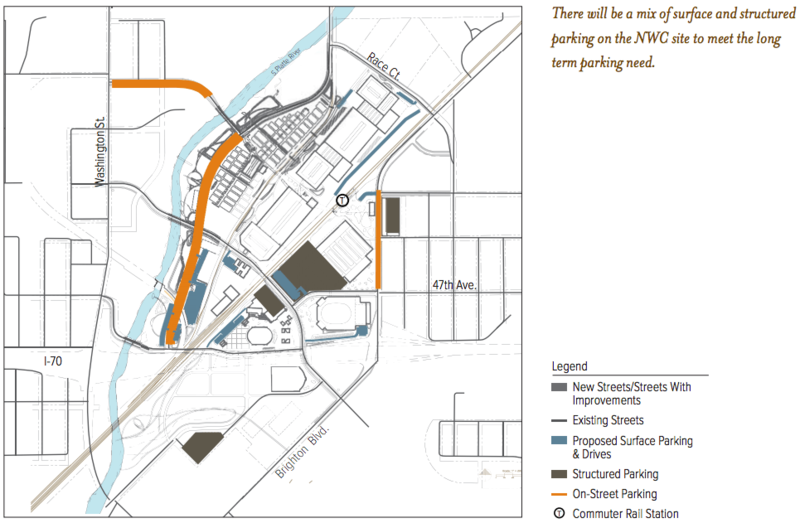 There are probably options available that would generate less traffic and prove less expensive in the long run, if the city decides to build less parking and invest in a more robust transit plan for the National Western Center and its surrounding areas. Currently, planners want to include an elevated “High Line-like” pedestrian and bike bridge that connects to the future National Western RTD rail station, as well as a circulator bus or shuttle around the campus. The circulator may work well for people already in the area, but beefing up bus service on Washington Street, Lincoln Street, Brighton Boulevard, and 47th Avenue is more important to cut down on the “long-term parking need” that planners say they need to fill. To be clear: The ballot measure asked voters to fund a new National Western Center, not vote on the plan itself. The blueprint “recommends further study to refine the ultimate parking numbers and locations.” So exactly how many parking spaces will be built is subject to change. What is certain is that the more parking you build, the more people will drive. That is good to know. We will need to speak out for less parking and a more robust urban/western destination. Traffic is already terrible and I dread the days I drive on the weekends. I don’t know why the city would see a need in so many parking spaces. Although a high-line would be a great feature for the area. NYC’s High-line is pretty robust and the new section is very nice. It could be a great connector to transit options and removing barriers to travel through the area. The rendering shows no dedicated bike lane and massive concrete sidewalk (illegal to bikes). Garbage from day one.